WHAT IS THE SHIPPING CHARGE AND DELIVERY TIME? CAN I HAVE THE DANISH VAT REFUNDED? Yes, we ship our products to all parts of the world. We ship with UPS for standard orders, and use a dedicated shipping company for large orders and sofas etc. What is the shipping charge to my country? All orders are shipped from our warehouse in Denmark. All normal orders are shipped with UPS. You will receive an e-mail with shipping information when your package is on the way. Sofas, Large or bulky furniture and large quantity orders are shipped with a special carrier depending on the destination. 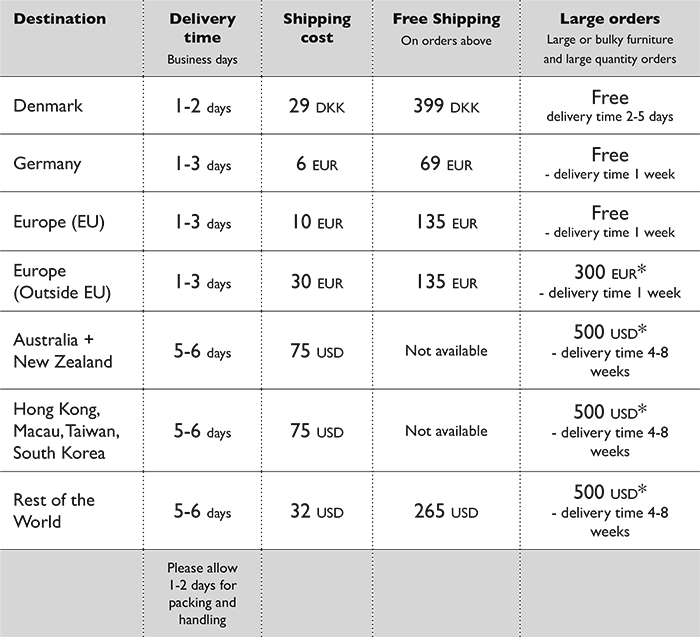 You will be contacted directly regarding the delivery time, as it varies depending on the country. Your order is delivered to street level only, and will not be carried inside at your destination address. The customer is responsible for the disposal of pallets and other packaging used in connection with the delivery.